The long wait is over. UFC 128 is now official and complete. With 12 fights on its card, UFC 128 will take place on March 19 at the Prudential Center in Newark, N.J. 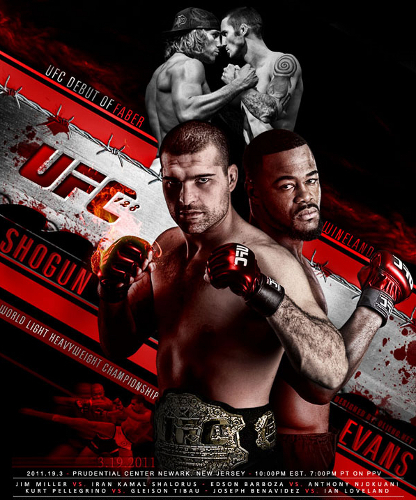 The official fight card for this March’s “UFC 128: Shogun vs. Evans” event is now complete. UFC officials today gave the final card and finalized the two remaining slots for the March 19 event. “UFC 128: Shogun vs. Evans” will take place at the Prudential Center in Newark, N.J. The 12-fight lineup includes preliminary-card bouts of welterweights Mike Pyle (20-7-1 MMA, 3-2 UFC) vs. Ricardo Almeida (13-4 MMA, 7-4 UFC) and middleweights Nick Catone (8-2 MMA, 2-2 UFC) vs. Dan Miller (14-4 MMA, 5-3 UFC). Pyle, is looking forward for his fifth win in six UFC fights. After a submission win over Chris Wilson, he had suffered a round two TKO loss to Jake Ellenberger in January 2010. That rebounded with a submission victory over Jesse Lennox back to back with a decision win over John Hathaway. Almeida, has won four out of his five fights. All of which are from UFC. His only defeat came via submission to former champ Matt Hughes. However, he had rebounded from that loss via unanimous-decision win over T.J. Grant at UFC 124. His most recent wins include Matt Brown, Kendall Grove and Matt Horwich. Catone, fights for the first time in 13 months. He was expected to meet John Salter last May at UFC 113 but a back injury forced him out of the card. Miller will be rebounding from three consecutive losses that kept his career in jeopardy. His recently dispatched Joe Doerksen by split decision at UFC 124, and was followed by a submission victory over Salter at UFC 118.